I recently purchased two online drawing courses created by former Disney Animator, Aaron Blaise, including How to Draw Human Anatomy, and Character Design. 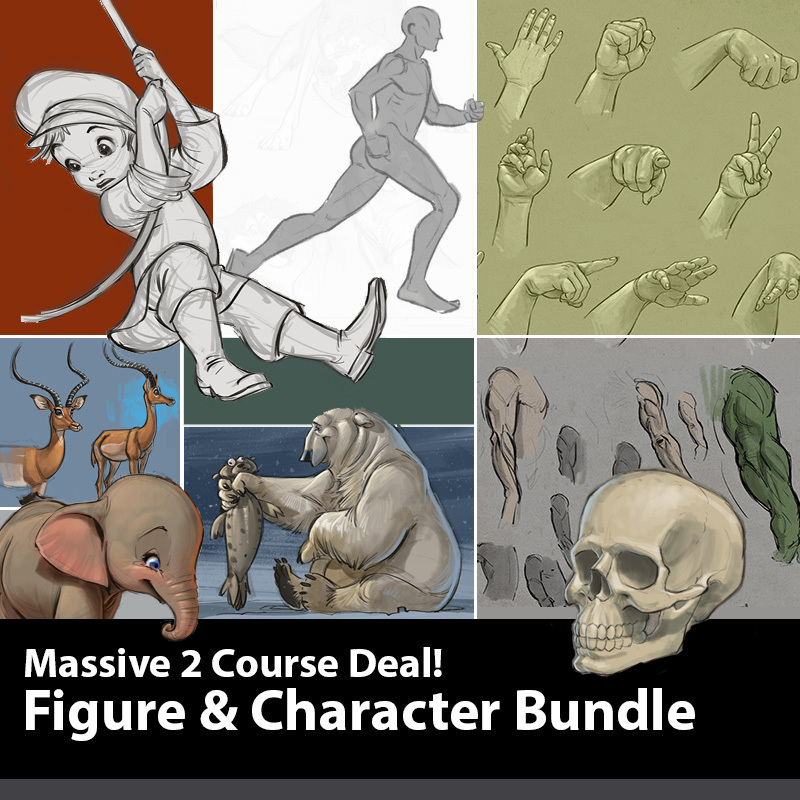 Both courses were included in Aaron's Figure Drawing and Character Design Bundle, pack deal. My own drawing style is heavily influenced by early Disney animated classics (think pre digital animation), which you can see in the more rounded lines of my characters - as opposed to the more angular character design lines you find in Marvel and DC comics etc. I wasn't sure how much I'd learn from either of these courses, baring in mind I've already studied both topics in detail in Art School, and have been designing my own characters since I was in primary school, but Aaron's a veteran and easily out classes my animation skills. Both courses are entirely presented as video tutorials with Aaron, at his desk, speaking to camera, cut with video captures of his drawing (all in real time). Aaron speaks very clearly and gives a running monologue of his thinking and choices as he draws. All work is drawn digitally in Photoshop but you could easily follow along using pencil and paper. Overall it's very much as close to a one-on-one class you can have without Aaron being in the room with you. Aaron even provides the source files of his drawings for both courses in the bonus resource materials. 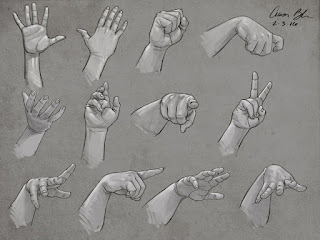 draw hands from any angle. Of the two courses I thought this would provide the least new information but Aaron covers every aspect of the human body in such detail over this 9.5 hour course that I always found some tip or new information useful to keep in mind for future drawings. 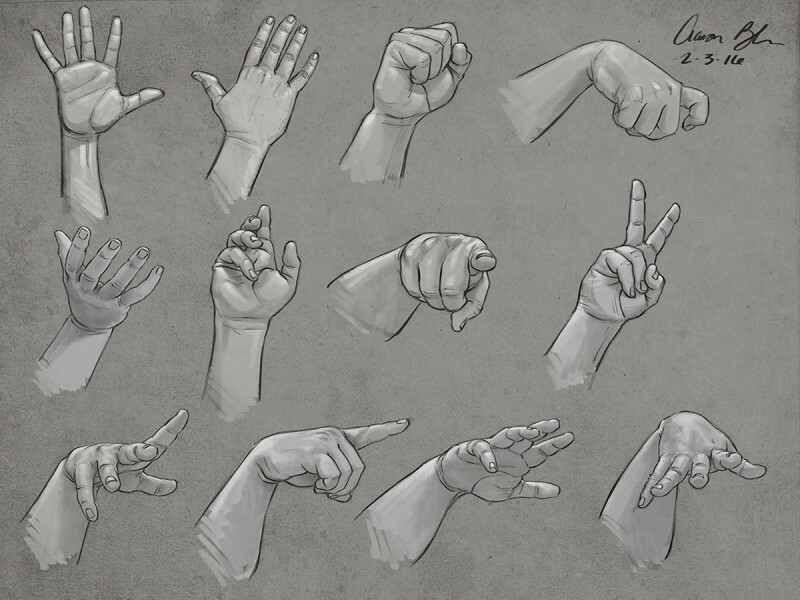 If you're one of those artists whose always struggled with hands or feet then Aaron's tutorials on these gives some great tips for making drawing each from any angle a less daunting process. You may even refer back to those specific lessons several times. There's also a great section on the body in motion and drawing the body for animation (which features the best demonstration of animated walk cycles you'll ever see). If you've never done any anatomy study or feel your efforts are far from where you'd like them this course is well worth your time. Everything is drawn in real time, which makes the individual lessons quite lengthy (ranging from around 20 minutes to and hour on average) but the information is extremely detailed and well demonstrated. a Peter and the Wolf Animated Film. This 16+ hour video course was actually the reason I purchased the bundle. Whilst I have somewhere around 40 years experience designing my own characters, I've never really developed characters on the same scale as Aaron i.e. for feature animated films. If nothing else I expected seeing Aaron's process would be interesting and I was sure there would be plenty of useful tips along the way. Through out the course Aaron steps you through the entire process of character design from research, tips on drawing characters in general through to pushing your designs further and getting more clear and dynamic posing into your finished designs. The course finishes with a series of videos following Aaron through the entire character design process for an animated production of Peter and the Wolf. Several of these videos alone are 90 minutes or more in length so you'll really need to set aside some time to get through them. Overall the course ended up being something of a refresher course for me. However if you're new to character design or feel you have plenty of room for improvement, Aaron's lessons are solid foundations to build upon. I did pick up a few new tips, specifically the Less Than and Greater Than technique of character posing that I'd never come across before, and I have found myself more consciously thinking about better and clearer character poses (and looking at the silhouette of poses) more so than I have in the past (now that Aaron reminded me I should be doing that!). My only criticism of this course is I feel the Peter and the Wolf series of videos are just too long. It is great to see Aaron draw everything in real time and hear his thinking as he goes but, if you've done the anatomy course first and waded your way through all the character design lessons to this point, you've seen Aaron draw in real time quite a lot. You're very familiar with his drawing process and should be able to learn just as much from seeing a progression of character development sketches with Aaron explaining briefly his thoughts about each drawing. I'm not saying watching Aaron draw isn't compelling by that point, it's just that the video length really makes it difficult to set aside time to watch, if you're trying to progress through the course on a daily basis. I'm the kind of person who can't do two things at once that require my full attention. I can't have a tutorial running in the background whilst I work on drawings or whatever else I'm doing because my mind will tune out whatever I'm not focused upon. For example I listen to a lot of podcasts but not whilst I'm drawing. I'll get so into the zone on drawing that I won't hear a single word of any podcast I'm listening to - even if I'm listening through head phones or ear buds. I know some artists watch DVDs and movies whilst they work and I've no idea how they can? If you've ever read Richard Williams, The Animator's Survival Kit, you'll know one of the first things he tells you is to turn off all distractions - specifically music - because it'll affect your work. I'm not sure if I agree but for me, it's pointless having music (or anything going) if I'm just going to zone out from it. These two courses combined as a bundle are excellent value. You don't often see art created in real time with the rise of 'Speed Drawing/Painting' videos on Youtube, and Aaron's conversational explanations, as he goes, keeps you doubly engaged. I would recommend both courses to beginner/intermediate artists looking to further develop their skills through someone who has serious industry credentials. It's particularly relevant if you find yourself drawn to the Disney style of figure drawing and character design for animation. 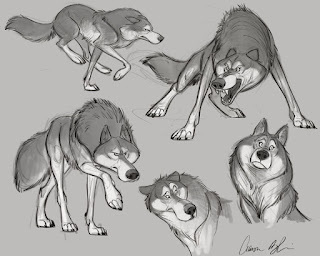 It's worth noting that Aaron also provides a lot of free 'sneak peak' instructional content from his courses on his website so it's worth browsing around for those (you can see the full 30 minute video of how to draw cute from this character design course by clicking the link). They'll give you a good sense of each course if you do want to try before you buy.